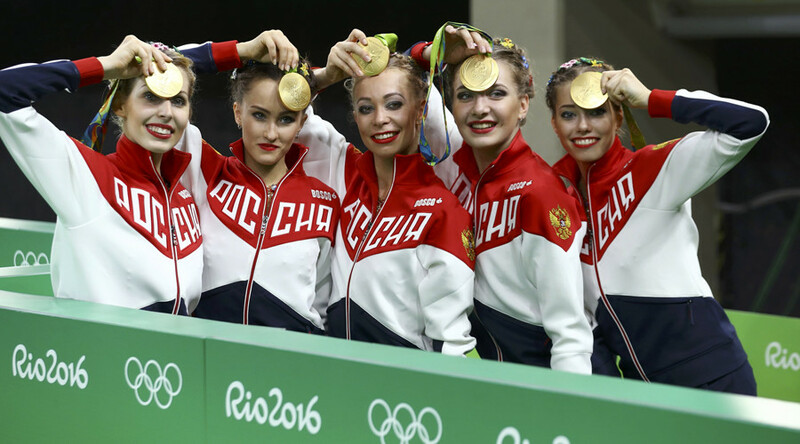 Russia’s women's team all-around rhythmic gymnasts have won gold in their event to guarantee Russia a fourth place finish in the overall medal standings. The team of Anastasia Bliznyuk, Anastasia Tatareva, Maria Tolkacheva, Anastasia Maksimova and Vera Biriukova earned 36.233 points to claim top prize. The silver medal went to Spain with Bulgaria claiming bronze. Russia have now won the event in five straight Olympic Games: at Sydney 2000, Athens 2004, Beijing 2008, London 2012 and now at Rio in 2016. Thanks to their latest victory, Team Russia finished fourth ahead of Germany in the unofficial table of overall medals won. The final day of the Olympics saw 12 medals up for grabs, Germany only have the chance of victory in the mountain-biking event. In all, Russian athletes won 54 medals: 18 gold, 17 silver and 19 bronze; Germany have 42 medals: 17 gold, 10 silver and 15 bronze. In the event of the countries having the same number of gold medals, the advantage will be go to Russia as they have more silver medals. In the current overall medal standings, the USA has finished first, second place has gone to Great Britain and with China in third.